More than 250 decision makers, food safety and quality specialists, engineers and designers as well as other high-level representatives of food-related industries and academia gathered on occasion of the EHEDG World Congress on Hygienic Engineering & Design 2012 in Valencia to learn about this increasingly important topic in order to enable the manufacturing of safe food. During 25 lectures various topics were discussed including the role that EHEDG plays to help ensuring food safety – e.g. the principles and latest developments in hygienic equipment and factory design, the layout of a hygienic process environment and the adequate use of construction materials, advanced welding technology, EHEDG test methods and certification as well as new trends in cleaning and disinfection. The lecturers shared their know-how with the delegates from more than 20 countries world-wide. The event not only attracted equipment & plant manufacturers, but also food producers, representatives from the pharmaceutical and cosmetics industry as well as scientists and consultants. All attendees enjoyed a perfectly organized event hosted under the umbrella of EHEDG International and ainia centro tecnológico who are heading the EHEDG Regional Section Spain and a leading innovation and technology centre with own laboratories and pilot plants in Valencia. The institute also offers testing and certification according to the recognized EHEDG test methods in its facilities. “The EHEDG World Congress is the highlight of our 25th anniversary year” said Sebastián Subirats, the Director of ainia on behalf of the organizers “and after having experienced numerous contamination problems in the past, we are proud of having made it an outstanding event for the sake of increasing the awareness of hygiene in safe food production”. The positive feedback of the attendees reflected the achievement of this goal. The sponsoring companies found excellent opportunities for presenting themselves in the congress location (the Chamber of Commerce Valencia) and the Congress programme was enriched by scientific poster presentations, One to One business meetings, face-to-face expert talks and many opportunities for experience exchange. On the pre-congress day, about 50 EHEDG Regional & Subgroup Chairpersons as well as the EHEDG Executive Committee members gathered in the premises of ainia centro tecnológico for their annual Plenary Meeting. The meeting focused on discussing the EHEDG strategy in view of the challenges of the quickly growing expert network and for updating each other on the state of affairs related to the numerous technical and local activities of the EHEDG. Timothy Rugh and Tracy Schonrock were welcomed on behalf of the US-American Standards Organisation 3-A SSI and gave an update on their latest work. Knuth Lorenzen announced the continuation of his EHEDG Presidency for another 3-years term after having been elected by the Executive Committee on occasion of its last meeting in September 2012. The Congress furthermore offered the platform for the presentation of the “Hygienic Study Award” on an international level in honour for three outstanding PhD theses in the field of hygienic design of machines and equipment, the optimum use of materials and material surfaces under hygienic aspects, as well as the general field of fouling and cleaning of food-related materials, food contact materials, tailored surfaces and attachment of microbial species. The winners were Hannes Stoye from TU Dresden and Patrick W. Gordon from the Cambridge University who both achieved a 1st place as well as Martin Schoeler (formerly TU Dresden) as a 2nd price winner. In addition, EHEDG gladly honored three of its experts for their outstanding and long-term commitment as well as for their distinguished services to the organization, namely Knuth Lorenzen, Tracy Schonrock and Karel Mager. The highly informative congress days in Valencia fulfilled all expectations both on the part of the delegates and of the organizers and there is demand and commitment to repeat the event in the future. The next opportunity for participating this high-level expert platform will be the EHEDG World Congress on Hygienic Engineering & Design from 23-24 October 2014 in Parma/Italy in conjunction with Cibustec. The next EHEDG Plenary Meeting will take place on 10-11 October 2013 in Prague, Czech Republic. 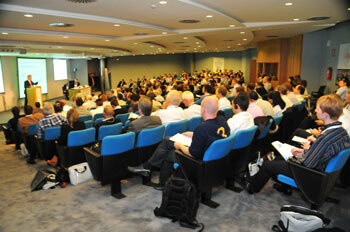 To learn more about the past event in Valencia, please visit www.ehedg-congress.org. All details related to the upcoming congress will be announced on the same webpage in due time as well as on www.ehedg.org.